The book is written by Kenneth Blanchard and Spencer Johnson. Kenneth and Spencer are well known author, consultant, and trainer. They have authored and co-authored several books on varied topics of helping people achieve better health, life and success. The book tries to achieve the objective using a story format. A young man meets the one minute manager, and through interactions with one minute manager and his repartees gets to know the secrets of successful management. The key principle of getting good results out of people is simple: People, who feel good about themselves, produce good results. The principle is achieved using 3 techniques. The One minute goal setting – The goal should be clear and concise. It should be written in less than 250 words. If people look at their goal every day and check their behaviour and performance against these goals, they will be happy and will produce good results. The One Minute praising – Whenever people do something right, take a minute to praise them. Tell people specifically what they did right. Express your feeling, and show them you care. The One Minute reprimand – Whenever experienced people do something wrong, take a minute to reprimand them. Tell people specifically what they did wrong. Express your feeling, and show them you care about them. Tell them you feel well of them but not of their performance in the particular situation. The book is written in story format that explain why these three techniques work. I really like the narrative format of the book; it helps in grasping the content with ease. The book is short and simple, and you can complete the book within an hour. It is amazing how much advice authors have been able to include in such a short book. But at the end, I felt the book should have gone more in depth on advises. Also, it would have been better if more advises could be added. Another point I did not like about the book is that the book assumes an idealistic world. Just like people need one minute manager to get the best out of them, wouldn’t the opposite will be true as well? Wouldn’t One minute manager need one minute employees (good performers) as well? People have natural tendencies to work well in certain areas. Also, they have life outside work that impacts their work as well. What about those scenarios? Will One minute reprimand work in these scenarios? What should manager do if it does not work? Book closes too early to be able to answer these scenarios. Little more depth in these advises would have help answer these complex situations. 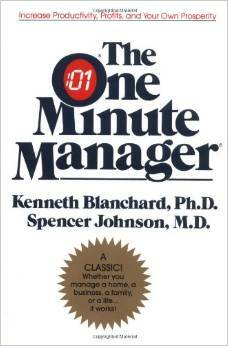 Overall, “One Minute Manager” is a short easy read book with few good advises. Every manager who needs to clear his mind and simplify his managerial style will benefit from the book. Don’t expect this book to be bible on people management. But it will certainly provide few great lessons to follow. It will certainly do it in fun and easy to follow way.